Kharahhorin (also spelled Karakorin and Kharkhorin) is a city in Central Mongolia, about 300 km west of Ulaanbaatar as the crow flies. Locals call it Har Horin or Harhorin. Karakorum and its surroundings have been the location of many imperial capitals throughout history, including that of the Uighur Empire (9th century), the Mongol Empire (13th century) when Marco Polo visited, and later on, the Northern Yuan. Microbus from the Dragon Bus station in Ulaanbaatar. The Dragon Bus station is on the west side of UB, along Peace ave. Check the bus schedule inside. Outside will be small Korean minivans; usually, there is a sign in the front window. Look for KharKhorin or Harhorin. There are also tour companies that ply the route from Ulaanbaatar to Karakorum. 47.12361102.504733 KharKhorum (Harhorum, KharaKhorum), Harhorin, Mongolia (Take main paved road west from Ulaanbaatar, At Lun, the road splits you can take either branch, but most take the southern branch. If you take the southern branch the road is paved all the way, except for a 50km section East of Lun.). any. 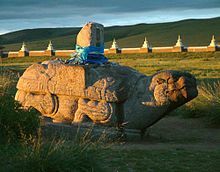 The capital is located on the North side of the Erdene Zuu Monastery. Go to the North west corner of the Monastery, enter the fenced compound, used to be a sign here stating that the UN had paid for the fence. About 100m north you will come to some small fenced areas and a stone turtle, one of two inside the city fence. Between the turtle and the stupa is the remains of Ogodei Xaan's palace. A German and Mongolian team has been excavating here. The other stone turtle is in the SE corner. A third is in the hills south of Erdene Zuu. N47 12.361 E102 50.473 none. [dead link] Erdene Zuu Monastery (Erdenezuu), Harhorin, Mongolia. Daily. This Monastery was originally built in the 1500s, but has been destroyed several times. It is free to enter the grounds, but a tour inside the old temples costs 3000 ₮, 5000 more to take pictures inside. In the NW corner is an active Temple serving the local population, this temple is in Tibetan style. none. 47.00749102.154124 Tovhon Temple (Tovkhon Temple), SW of Harhorin (From Harhorin go south, upstream on the west side of the Orhon River.). Daylight. Go Southwest from Harhorin on the west bank of the Orhon River to N46 56.000 E102 22.322 turn right (west) There is a park entrance with US$3 fee per person. Continue up the valley until you see the many blue cloths turn up the hill on the SW side. The upper part of the road is in poor condition. Alternately, from the Orhon Waterfall, go NE along the river until you come to the bridge at N46 48.503 E102 1.668 follow the river on the west side to the turn mentioned above. Great view from the top. USD3. During the summer, there are several restaurants in the shopping area. The white hotel between Erdene Zuu Monastery and the shopping area, on the North side of the canal serves meals. Several small cafes were open during the day near the container shopping area 1.5km west of the Erdene Zuu monastery. Morin Jim, Uvurhangai Aimag, Harhorin Sum, Erdene Zuu St. (From Erdene Zuu, go west about 2km), ☎ +976 99242980. 7am - 10pm. Guesthouse and Cafe. Grilled Chicken, Mongolian Connected with Horsetrails tour agency US$3-5. There are several Hotels, guest houses and ger camps. Morin Jim Guesthouse, Uvurhangai Aimag, Harhorin Sum, Erdene Zuu St. (From Erdene Zuu, go west about 2km), ☎ +976 99242980. Bed in shared ger (yurt). Clean, outhouse, no shower. See the webpage for local horse trips. $8. Get a shared car or jeep, or minivan to Ulaanbaatar, Hujirt, or Tsetserleg from the east side of the Container marketplace in the middle of town. This city travel guide to Karakorum is a usable article. It has information on how to get there and on restaurants and hotels. An adventurous person could use this article, but please feel free to improve it by editing the page.